The BYU Cougars huddled just before kick-off of the Varsity Cup National Championship game. 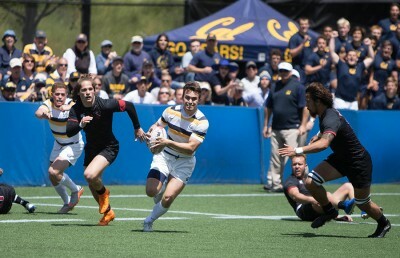 They turned and looked across the field at the underdog Cal rugby team. They performed their Haka dance — bulging their eyes, brandishing twisted tongues and screaming with the confidence of a team that has won the last three consecutive titles over their current opponents. They danced with the confidence of a team composed predominantly of older players, in the middle of a 44-game winning streak, holding an indomitable size and speed advantage. They danced with the confidence of a team that would be up 12 points late in the second half, having only to close the game with their immovable defense on their home field at which they had never lost a game. They danced with the confidence of a team that knew they would win. And the Bears stood and watched. Going up against a 22-0 Cougar team that’s enjoyed such recent success against this Cal program had to be daunting. 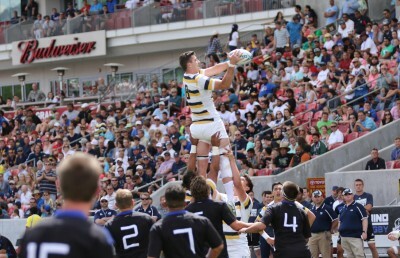 The premier team in collegiate rugby’s history had yearly ceded their crown to BYU the past four springs, losing the last three matchups by a combined 16 points. For the first time in Cal head coach Jack Clark’s tenure, no player on the Bears’ roster had won a 15s national title. But the Bears will be be bringing the Varsity Cup back home. It was clear from the jump that Webb and fifth year senior Nicolas Boyer were prepared to carry this team to the title. After barely preventing a BYU try on the game’s opening possession, the Bears sprinted the ball deep into BYU territory but couldn’t finish as senior Patrick Barrientes couldn’t move the defense on a pass that would have led to a score. 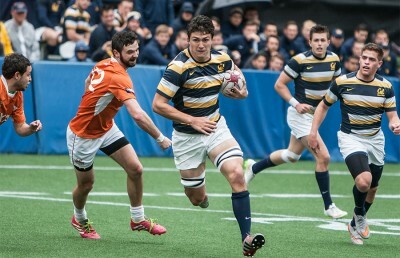 Undeterred, just a few minutes later, the Bears sailed the ball down the line from Boyer to senior Anthony Salaber to Webb to Barrientes to fifth-year senior Lucas Dunne, who in the blink of an eye was lying in the try-zone for a 5-0 lead. The Bears soon got a rude reminder of just how quick BYU’s roster is, as front and back line players alike picked apart their defense for two easy tries. Just when momentum seemed to wear the black and blue of BYU, Boyer made perhaps the pass of the season, drawing four Cougars’ attention before flipping the ball to sophomore Zachary Tavenner for another try, sending the Bears into halftime down 14-12. BYU’s speed again trumped the Bears in the beginning of the second half, and the Cougars raced to a 24-12 lead only 10 minutes in. With 15 minutes left and down 29-19, Boyer missed a chip shot penalty kick that could have put the nail in the Bears’ coffin. But sophomore Jake Goena soon broke through the BYU defense, and Russell Webb made another perfect pass leading to a Salaber try. Minutes later, Boyer took it in for a try himself, giving the Bears the decisive lead. Not letting up, Bush scored one last try to ensure the victory with a final 40-29 lead. Webb was deservedly rewarded for his excellent passing and kicking with the “Man of the Match” award, but this was undoubtedly a full-team effort. Just as important to the win were the impeccable line outs led by senior James Kondrat, the gutsy defense by an undersized freshman Nic Mirashem and the frontline-leading play of Walsh. 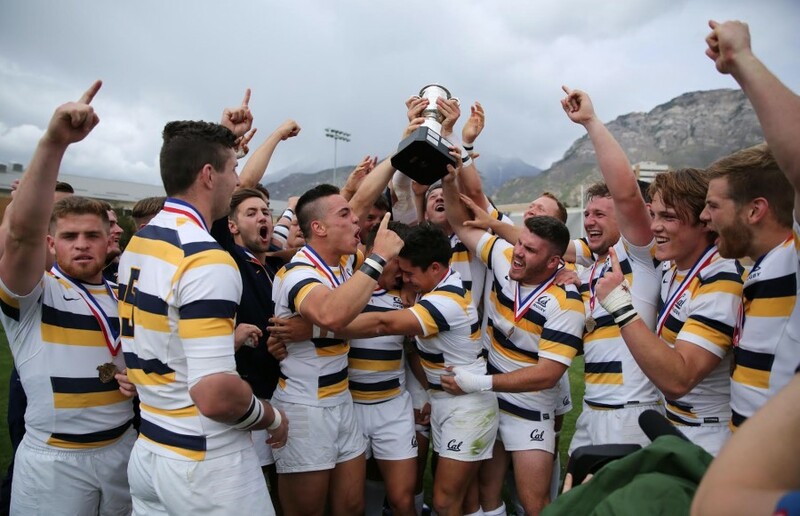 The four-year national title drought has taken a toll on the psyche of Cal rugby, but reclaiming the throne in enemy territory made the resurrection all the sweeter. The added meaning in winning after four brutal years of missed opportunities was especially evident with the normally stoic Clark, who fought back tears in his post-game interview. He described the win as one of the best in Cal’s history, and it’s hard to argue with that assessment. For these Bears, the long road to redemption has finally found its conclusion. Austin Isaacsohn and Andrew Wild cover rugby. Contact them at [email protected], and [email protected], respectively.